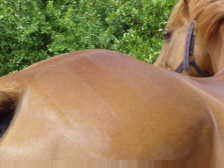 Another method is to use a mane and tail comb (the ones that are around 10cm long) and draw perfectly straight wide lines on your horse's quarters, extended approx 20cm downwards from the middle of the hindquarters, on either side (see photo on right). Once again, the coat has to be clean and damp. Normally three stripes are used, and often 'sharks teeth' are used which start where the stripes end. Sharks teeth are difficult to explain without a diagram - but one will be coming soon! 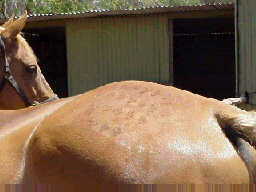 For more information, there is a really fantastic article at Hoofs and Horns by Sandra Morphett, called Applying Make Up to Horses. The clothing for cross country is very different to that for the other phases. Ties and jackets are not required, although at pony club (and I think EFA) level you need long sleeves. As I don't have proper 'silks', I actually wear my pony club uniform without the jumper, cross country, although I plan to get a proper shirt ASAP. You must wear an approved helmet, which can be covered in a brightly coloured silk to match your gear. People often also match their horse's boots, browbands (see instructions on ribboned browbands here ) and saddle blankets, and this can look really great. Although I don't wear a back protector (I've only done up to 2'6") I'd definitely recommend wearing one. 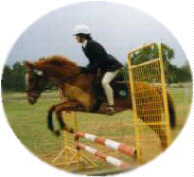 Gloves and rubber covered reins, or reins with stops give a better grip, and long boots are also good for cross country. If you horse wears boots or bandages they must be secured with electrical tape. I also have to wear a medical armband, which lists your name, age, doctor, medical history, allergies, vet etc etc. They are compulsory here, and if they are for the event you are competing at make sure you buy one. Although they are called armbands, a lot of people prefer to strap them to their boot leg. Once again, you must be gear checked before you start your round. When it is your turn you will go into the start box (a three sided box) and then the starter will count down from 5 or 10, and then you're off!! Some people get their horses really hyped up in the start box, but I personally wouldn't recommend it - after a few one day events your horse will know exactly what the start box means and you won't need to hype him up! The judge will now describe the workout to you. (The photo on the left is Tisca and I during a workout, January '99) Repeat it back to the judge if you aren't sure about it. The rider who was called in first will perform the workout first, and then the person who was called in second and so on. It is during the workout that you have a chance to really show off your horse, so make sure you listen carefully and don't make the workout to small or too large (both common mistakes as the workout is normally done in an unenclosed area). When all competitors have completed their workout the judge will normally stand before you and pointing to each place getter, will say 'the bay first, that chestnut second, that bay third' or similar. If it is a rider class the ribbon is tied around your left arm, if is is a hack class it is tied around your horse's neck. When given your ribbon say, 'Thankyou' or 'Thankyou judge', and after all ribbons are awarded turn to the rider on either side of you and congratulate them. Some riders will say something like 'Thankyou judge, congratulations riders' after the ribbons are handed out. While the judge is awarding you your ribbon they may give you advice on what you did wrong, or right. This can be really helpful! Leave the arena with the winner leaving first, then second and third, and the non place getters leaving last.